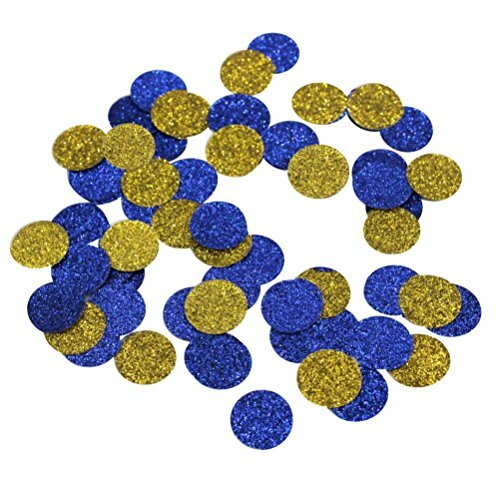 Use this blue and gold glitter confetti to decorate tables, stuff invitations, or toss it at the Bride and Groom on their wedding day. Perfect for weddings, bridal showers and baby showers! This confetti looks darling and so festive sprinkled on a table or dessert cart at a party! Glitter is SINGLE-SIDED with white on the back. Please view the second image to see the back of the glitter dots. Dot confetti looks fab sprinkled on your gift or banquet table. It's a fun and attractive way to liven up any sparse table space though! Circle are 3/5 inch small size . If you have any questions about this product by Mybbshower, contact us by completing and submitting the form below. If you are looking for a specif part number, please include it with your message.